This one-room frame school, built ca. 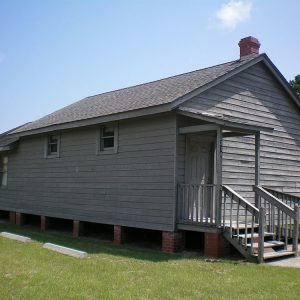 1937, was the first separate school building constructed for African American students on Hilton Head Island. It replaced an earlier Cherry Hill School, which had held its classes in the parsonage of St. James Baptist Church. After the black community on the island raised funds to buy this tract, Beaufort County agreed to build this school. This was an elementary school with one teacher, with an average of about 30 students. It served grades 1-5 when it opened in 1937, adding grade 6 the next school year.